Bill Maher used the opening monologue of his Friday HBO show to bid a not-so-fond farewell to ousted Secretary of Homeland Security Kirstjen Nielsen, and to encourage the folks at Fox News to brush up on their English. The comedian roasted Fox News for a number of recent gaffes, like when the network incorrectly labeled a trio of Central American nations as "three Mexican countries" during a segment on Fox and Friends. That error, which was widely criticized, took place as the morning show's hosts offered up their frequently favorable coverage of the Trump administration. As they were talking about the White House's decision to reduce aid to El Salvador, Guatemala and Honduras, a banner flashed on the lower-third of the screen that read: “Trump Cuts U.S. Aid to 3 Mexican Countries." The network subsequently apologized. Addressing the “Mexican countries” error and several other spelling mistakes — like a graphic that read "Selife" instead of "Selfie" and "Spelling Be" instead of "Spelling Bee" — Maher invoked a popular and, to most people, offensive conservative talking point usually directed at migrants. Maher's most searing jokes targeted Nielsen and the policies she enforced at the U.S. southern border. The recently departed DHS secretary, who Trump asked to resign last week, infamously oversaw the forcible separation of migrant families and subsequent detention of children. According to The Washington Post, Trump was dissatisfied with Nielsen's performance and felt she wasn't fast or forceful enough in executing his immigration policies. The exodus, which included other top officials, reportedly came at the urging of Stephen Miller, a policy advisor known for advocating more extreme measures to curb immigration. 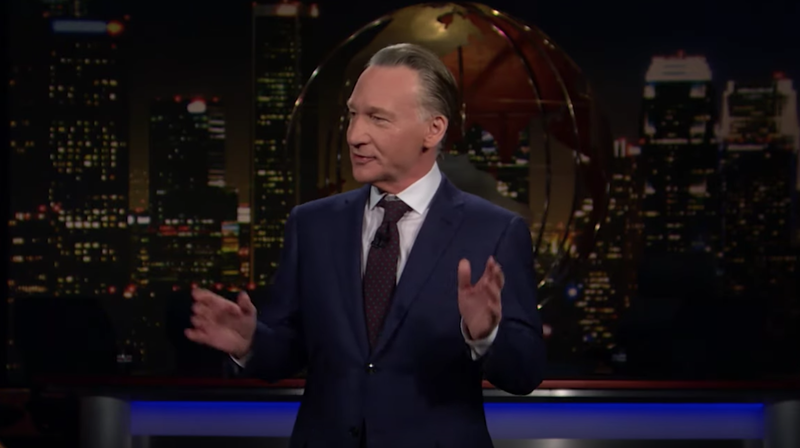 Maher then pivoted toward Trump’s latest push to relocate migrants to so-called “sanctuary cities” to punish Democratic leaders who have opposed his immigration plans. On Friday, Trump confirmed, via Twitter, numerous reports that stated he was mulling over the idea. “Due to the fact that Democrats are unwilling to change our very dangerous immigration laws, we are indeed, as reported, giving strong considerations to placing Illegal Immigrants in Sanctuary Cities only,” he wrote. “The Radical Left always seems to have an Open Borders, Open Arms policy – so this should make them very happy!